CHICAGO —The Association for Library Service to Children (ALSC) has awarded 20 mini-grants to libraries across the country in honor of Día’s 20th anniversary. Día, also known as El día de los niños/El día de los libros (Children’s Day/Book Day) was envisioned by children’s book author, Pat Mora and founded in partnership with REFORMA. It is a nationally recognized initiative that emphasizes the importance of literacy for all children from all backgrounds. Día is a daily commitment to linking children and their families to diverse books, languages and cultures which culminates yearly on April 30. The Día Turns 20 mini-grants are made possible by the Dollar General Literacy Foundation. The ALSC members who receive these mini-grants on behalf of their libraries will use them to make their Día Turns 20 celebrations even more impactful. “Congratulations to the 20 libraries who will be receiving this support to celebrate the exciting 20th year of Día,” said ALSC President Andrew Medlar, “and sincere thanks to the Dollar General Literacy Foundation for making these extra special celebrations possible as ALSC members continue to work in putting Diversity in Action in our communities every day." The mini-grant recipients are: Athens Regional Library System (Georgia), Auburn Public Library (Maine), Boone County Public Library (Kentucky), Catawba County Library System (North Carolina), Charleston County Public Library - Dorchester Road Regional Branch (South Carolina), Gloucester County Library System Glassboro Branch Library (New Jersey), Hutto Public Library (Texas), Kyle Public Library (Texas), North Lauderdale Saraniero Branch of the Broward County Library System (Florida) Old Bridge Public Library (New Jersey), Oxnard Public Library (California), Prince George's County Memorial Library System (Maryland), Sioux Center Public Library (Iowa), Socorro Public Library (New Mexico), Southeast Branch Library (Tennessee), Union City Public Library (New Jersey), Woodland Public Library (California), Yolo County Library (California), Ypsilanti District Library (Michigan) and Yuma County Library District (Arizona). 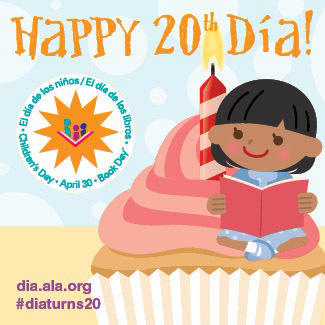 Día mini-grants are one way that ALSC is encouraging libraries to celebrate Día’s 20th. ALSC also manages the National Día Program Registry to help libraries and community partners share information about their Día programs throughout the year. For more information about additional Día resources, visit http://dia.ala.org/. The Association for Library Service to Children (ALSC) is the national home for Día. In 1996, Pat Mora, nationally acclaimed author of books for children and adults, proposed linking the celebration of childhood and children with literacy under the name El día de los niños/El día de los libros (Children’s Day/Book Day). Her proposal was later endorsed by Día Founding Partner REFORMA, the National Association to Promote Library and Information Services to Latinos and the Spanish-Speaking. Dollar General Corporation has been delivering value to shoppers for over 75 years. Dollar General helps shoppers Save time. Save money. Every day!® by offering products that are frequently used and replenished, such as food, snacks, health and beauty aids, cleaning supplies, basic apparel, house wares and seasonal items at low everyday prices in convenient neighborhood locations. Dollar General operates 12,198 stores in 43 states as of July 31, 2015. In addition to high quality private brands, Dollar General sells products from America’s most-trusted manufacturers such as Clorox, Energizer, Procter & Gamble, Hanes, Coca-Cola, Mars, Unilever, Nestle, Kimberly-Clark, Kellogg’s, General Mills, and PepsiCo. For more information on Dollar General, please visit www.dollargeneral.com.